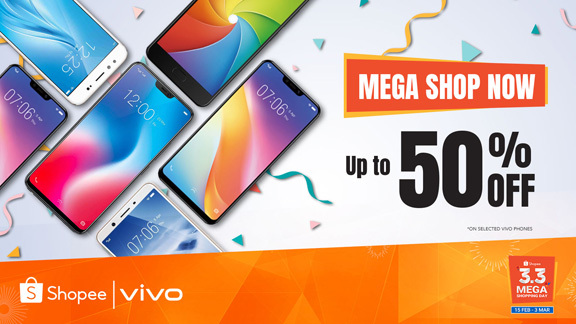 Online shoppers on the look-out for the coolest and newest smartphones can mark their calendars for March 3, 2019 as Vivo offers as much as 50% discounts on selected models for Shopee’s Mega Shopping Day. Vivo, one of the country’s leading smartphone brands, is giving customers the chance to buy the Vivo Y69 for only P5,599, Vivo Y71(2GB) for P5,499, Vivo Y85 for P8,999, Vivo V5 Plus for P9,999, and the Vivo V9 for just P10,999. Across all its models, Vivo promises the perfect shot with its superb photography settings and cutting-edge camera features such as the Vivo Y69’s Bokeh mode and Group Selfie setting, the Vivo Y71’s AI Face Beauty and Backlight HDR, as well as the Vivo V5 Plus’ special Sony-engineered image sensor and Selfie softlight setting. Phone users can have the same innovative mobile photography experience with the Vivo Y85 and Vivo V9 but can check their pictures or videos in FullView™ Display as Vivo upscales its screens for a better viewing experience. The FullView™ Display is also ideal for mobile games and with Vivo’s game mode feature available both in the Vivo Y85 and the Vivo V9, there’s nothing that will stop customers from having the best gaming moments. On top of each phone’s unique strengths, Vivo ensures its customers of a smooth user experience, optimum battery life and storage, and powerful performance across all phones. Go on a mega shopping spree and nag the perfect Vivo phone for you! Visit the official Vivo store on Shopee at www.shopee.ph/vivophilippines.